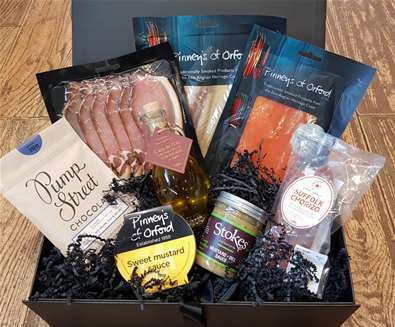 But, if you’re struggling with gift ideas this festive season and fancy giving the obligatory socks and slippers options a miss, why not try creating a rather special and very bespoke present in the form of a goodie-filled hamper packed with local produce from The Suffolk Coast?! We've picked a few of our favourite festive foodie establishments that will be sure to provide you with all you need to make a hamper that's bound to impress come Christmas morning! Say it with fruit! When the stodge of Christmas pudds and mince pies are taking their toll, it’s refreshing to tuck into a fruity feast. 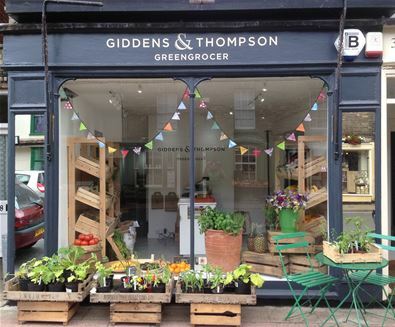 Giddens and Thompson Greengrocers are purveyors of high-quality fruit and vegetables located in the historic market town of Bungay. Here, you’ll find a wide selection of seasonal, fresh and locally sourced produce to make a super fruity hamper, bursting with colour and flavour! The beautiful range of luxury hampers from Pinneys make the perfect gift for any occasion. The hampers are packed with a wonderful selection of their favourite smoked products as well as tasty treats from local artisan producers. If you are looking for a personal gift then you can create a bespoke hamper and fill it with your very own choice of luxury items. 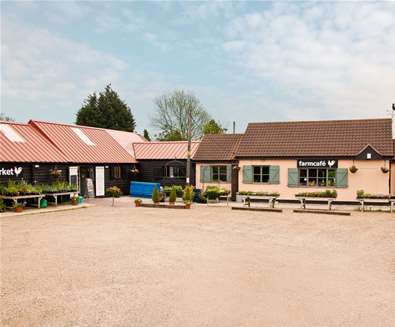 Head to White House Farm in Great Glemham on the 8th December and you will be able to find all you need to make up the perfect Suffolk hamper. From 5.30pm - 8pm, you can enjoy a complimentary glass of mulled apple juice and mulled wine plus mince pies and pastries by The Great Glemham Bake as you peruse the White House Farm Christmas Makers’ Market, Christmas Shop and Xmas Exhibition. The Makers’ Market will feature a range of local craftspeople selling handmade leather handbags, stained glass, seaglass jewellery, silver jewellery, wool work, woodwork, lanterns, handmade boxes, knives, pottery and paintings. In the Pop Up Christmas Shop there will be Suffolk honey, High House Fruit Farm Apple Juices & Jams, Pump Street Chocolates and Stokes Christmas packs. Entry is free but places are limited, to book tickets email enquiries@aldevalleyspringfestival.co.uk. 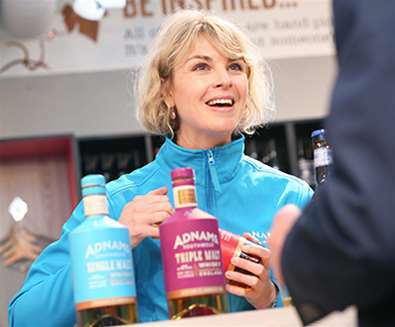 Put together a gift hamper of Adnams fine beers, wine and handcrafted spirits and we’ll guarantee that you’ll win over even the grumpiest of relatives! With stores located in Southwold, Aldeburgh and Woodbridge shopping is made easy. 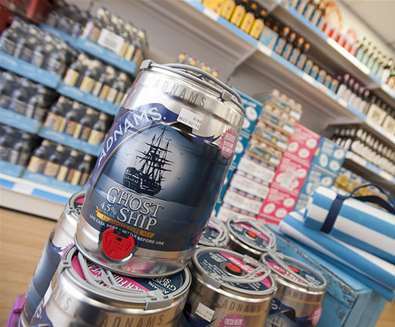 Ale lovers will appreciate a few bottles of their famous 'Ghost Ship', or for those who prefer a stronger tipple, there's the Single Malt Whiskey or the Copper House Gin gift packs. If you can't choose which to pop in the basket, then the 'Little Box of Gin-Dulgence', or the 'Whiskey Trio' boxes are ideal. 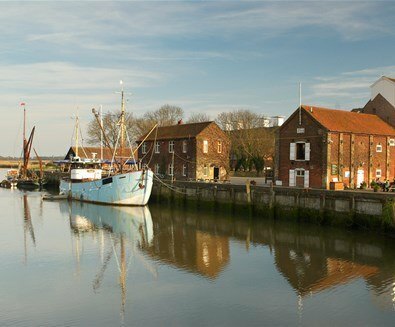 Of course, you could always push the boat out a little and throw in a tour of the famous Suffolk brewery or distillery for an extra special gift. 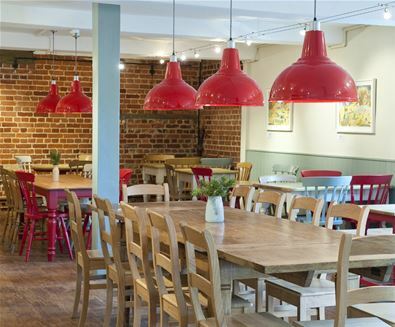 Take a trip over to The Suffolk Food Hall, just south of Ipswich. 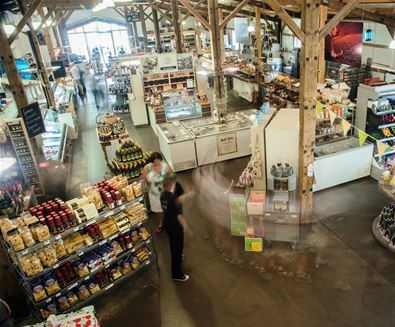 This place is sheer heaven for ‘foodies’ having not only a delicatessen but a grocer, bakery, fishmonger and a chocolatier... Which means the only problem you may have is what to choose! 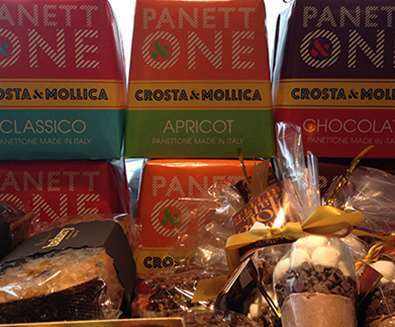 Alternatively, they offer an array of beautifully packaged ready-made hampers to make your decision just that bit easier! And you're still to buy your tree, you can buy a locally grown, freshly cut tree here too! 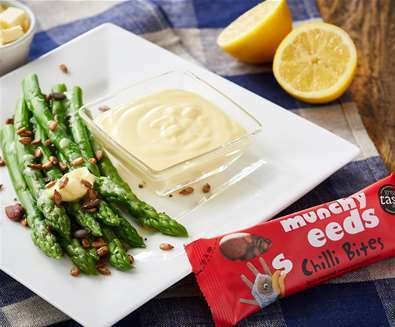 Put together a delicious gift box of products by Munchy Seeds, the family run business based near Leiston which has been the highest profile brand in the UK's roasted, flavoured and coated seeds market for 16 years. And the great thing is all seeds are suitable for Vegetarians and coeliacs, they are all free from gluten, wheat and yeast and have no artificial colourings, flavourings or preservatives. Just naturally delicious and available in handy snack packs or tempting tubs in an ever-growing list of varieties! 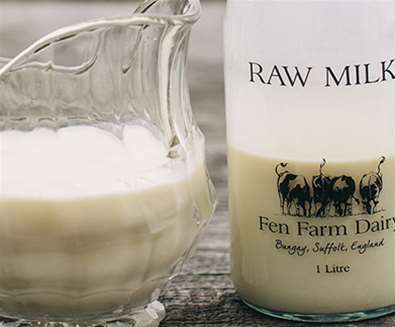 Situated just outside Bungay, Fen Farm Dairy can produce a delicious range of raw milk products including milk, cream, buttermilk, cultured butter and their famous Baron Bigod Cheese (which was served at the Royal Wedding this year!). 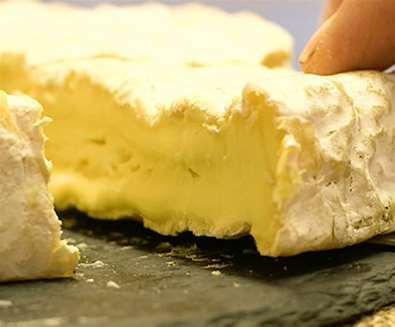 Stop by the farm's vending machine to stock up for your Christmas or Boxing Day feasts but make sure you call ahead if you want to buy a whole round of cheese, as they don't fit in the machine! 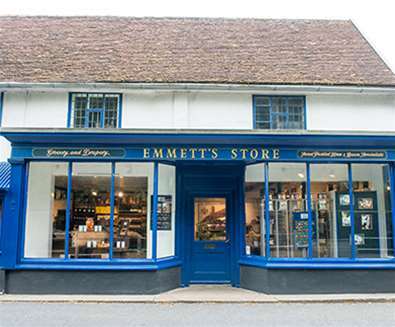 On Boxing Day, tuck into a mouth-watering ham from Emmett's; the oldest artisan ham and bacon producer in the UK. 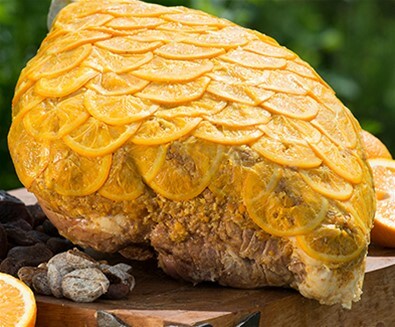 Famous for its Suffolk black ham, which was a favourite with many including The Queen Mother, Delia Smith and Rick Stein, the store also produces many other flavours plus a range of deli items including Spanish and Italian meats, Spanish almonds, figs and turrons, cheeses, olives and tapenades. 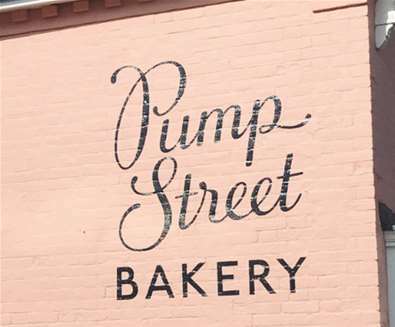 It wouldn't be Christmas without over-indulging with chocolate, and we can't think of a better bar to do it with than those from Pump Street Chocolate. With flavours including Madagascan Milk, Rye Crumb, Milk & Seasalt, Sourdough & Seasalt and Madagascar White and Bread & Butter - you will struggle to choose just one for your hamper! 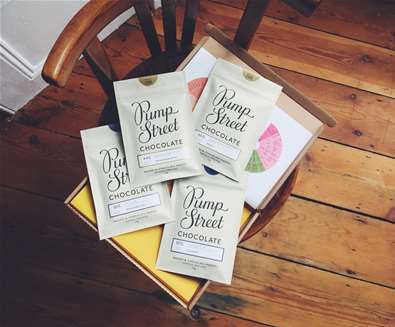 So it's good news that there's a range of gift boxes available to buy online at https://pumpstreetchocolate.com/, from their bakery in Orford or at Snape Maltings or in many delis and shops across The Suffolk Coast. Not only can you buy everything you need for a delicious hamper at Snape Maltings, but you could also pretty much get all of your Christmas shopping completed here with the range of shops dotted throughout the famous complex. 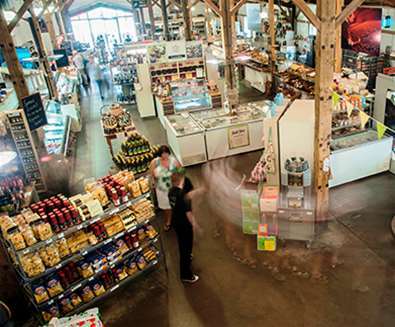 In the Food Hall & Fresh Pantry, you can buy delicious locally-produced, seasonal food - many of which are made and grown just a few miles away from the Maltings. Fill your basket with the best Suffolk sausages, the perfect Italian arborio rice, Panettone, Stollen, confectionary, jams, chutneys and crackers, plus a fine selection of wines and spirits. If you're lucky enough to be here on the 22nd December, then a stop by the Snape Maltings Christmas Farmers Market is a must! 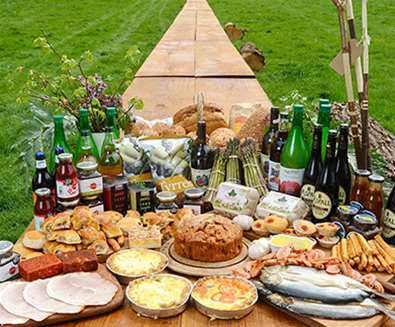 Here you can buy delicious festive fayre from some of Suffolk's finest food & drinks producers - a one stop shop for all your Christmas hamper and feasting requirements! 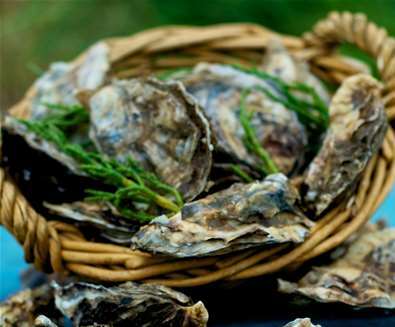 For more information on The Suffolk Coast's fantastic food producers, visit our Food and Drink guide! 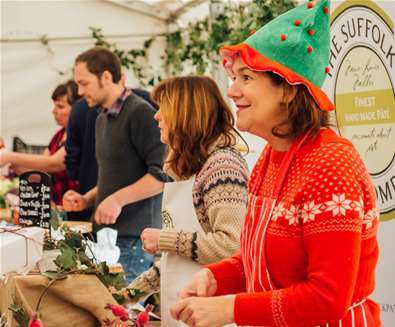 Snape Maltings' Christmas Farmers’ Market offers locally sourced fresh produce and treats for Christmas.